MikroMikko was Nokia Data's attempt to enter the business computer market. The computer has 64 KB RAM and is a CP/M operating system. There are several models of MikroMikko 1. The one pictured here is a M6 model which has two 5.25" 640 KB disc drives. But other models differ and can have one or two disk drives (360 KB or 640 KB), and even a built-in 5 MB hard disk (model M7). The MikroMikko 1 features high resolution graphics (800x327). It is quite heavy, the keyboard weighting alone about 2 kilograms! It was a very robust built system that was very suitable for hard environments such as schools. The machine has a linear power transformer and no fan. Cooling is done by a giant heat sink on the back side of the machine. Ergonomics has always played a great part in the MikroMikko series and this model has a keyboard with a built-in wrist support and a very slow screen that is very comfortable even though it has a 50Hz refresh rate. MikroMikko got several follow-ups: MikroMikko 2 had a very nice display with white background and 72Hz refresh rate. 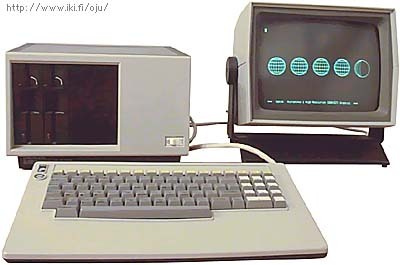 it was also the only real computer that was powered by an Intel 86186. While MM2 was partly MS-DOS compatible, MikroMikko3 was an ergonomic beauty that was fully pc-compatible. Texts and pictures from Mika Ojutkangas website. Thanks a lot! see more Nokia Mikro Mikko 1 Ebay auctions !